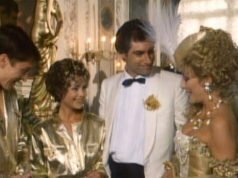 In the final scene of The Living Daylights we catch a glimpse of a peak lapel dinner suit on Timothy Dalton. Thanks to a Christie’s auction on 17 September 1998, we get to see that the dinner suit is actually double-breasted. Double-breasted suits were quite trendy at the time, especially the four- and six-button models that only fasten at the bottom button. That’s what Pierce Brosnan was wearing on Remington Steele. But Dalton’s dinner jacket has six buttons with the traditional two to button. The dinner jacket has double vents, four buttons on the cuffs and flapped pockets. The pocket flaps are the only inappropriate detail on the dinner jacket (and double vents, if you count those too), but typically the pocket slits are double-jetted and the flaps can be tucked in. The lapels and trouser stripe are trimmed in satin silk. The jacket has a claret-coloured lining. The trousers are labeled “EIGENTUM, LAMBERT HOFER, WIEN, 1150 WIEN, HACKENGASSE 10”. Lambert Hofer is a clothier and tailor in Vienna that specialises in costume and evening wear. The dinner suit sold at Christie’s for £1,725. Correct me if I’m wrong, Matt but in all the other Bond movies the character has only ever worn one full evening suit per movie in either black or midnight blue (with, from time to time, pre-1986, a white jacket and black trousers ensemble appearing as another warm weather evening outfit) but I don’t believe two and certainly never, as in this case, an incredible THREE black dinner suits in one movie! Seems unnecessary and very odd given that Dalton himself would scarcely have pushed for this level of munificence. What are your thoughts on the reasoning behind this? 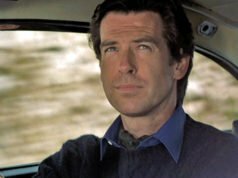 When the screenplay for this film was written, it was believed that Pierce Brosnan would play Bond. Thus, unlike with License to Kill, Dalton’s influence was more limited. You stole my thoughts! I agree it is odd to have three in one film – perhaps a mark of a logistically troubled production. And as I recall, the first one during the “defection” was excellent but the second one dropped off in quality (like the film as it went on). can’t really tell about this one. I suspect it fits fine based on its source. Connery has worn two ensembles in Goldfinger, one warm weather ensemble and one “normal” dinner suit, and three ensembles in DAF, with one white dinner jacket though. But I quite agree with you, it’s a bit too much. And if it was done with the purpose of showing diversity, well we barely see the last DB suit, so it’s quite useless. Bond doesn’t have to finish the movie in a dinner jacket. Maybe they did so as a subconscious re-enforcement of Dalton as Bond. When most people think of James Bond they think of a tuxedo wearing secret agent. Perhaps with all the Brosnan issues occurring prior, this was a subtle way to enforce the idea that Dalton was James Bond, not anybody else. Good points gentlemen. It occurred to me that, perhaps, the previous two were damaged in some way during filming (?) and when it came to the time of filming this closing sequence in Vienna another was called for. It seems that Dalton stepping in to the role at the 11th hour left the wardrobe people at a loss and this explains why a variety of tailors and outfitters ended up providing various items for the actor, rather than a Hayward or Sinclair situation which prevailed until then (preferable in my opinion as it brings a uniformity of look to the character’s wardrobe) . Interesting too that this was the last occasion when we witnessed Bond wearing a double breasted suit of any type in the movies. (No white dinner jacket since 1985, no double breasted suit of any type or sports coat since 1987 and no blazer since 1995! Diversity anybody??) As this suit was so briefly seen it was a shame that it wasn’t carried forward for Dalton’s next movie but I don’t really want to go there! David, I entirely agree with your comment about the importance of showing diversity in term of clothing. We really need some classic items back. I would also add that there are some typical British patterns or cloths that seem quite forgotten -flannel, tweed, several country plaids/checks-, at least since Craig took the job. No morning coat or stroller either since LTK. Good point for the outerwear variety with Craig though. And there’s no excuse for it, it’s just a matter of screenplay. Good point for the outerwear variety with Craig though. 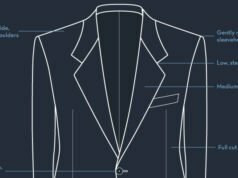 For some reason I can’t fathom, it seems that blazers and sport coats, which used to be the sportier, more youthful alternative to lounge suits, are now seen as old and stodgy. Young hipsters all wear tight-fitting dark suits with skinny black ties – what I call “the undertaker look”. At least Craig’s Skyfall suits showed some pattern – we can only hope that the fashion cycle will turn around soon. I can’t wait to see Bond in a classic navy blazer or countrified hacking jacket again! The reason for the dinner suit is simple. The concert at witch Kara plays is a black-tie event, especially considering both the head of MI6 and General Gogol are among the quests. Bond has of course secretly watched the concert, blending in with other guests in his dinner suit. Then after the show he goes to Kara’s dressing room and suprises her – still in the evening clothes of course. I agree it’s a bit silly to have THREE dinner suits in one film, they could easily just have had one and used it several times (preferably the shawl collar one, as that was indeed the best of the three). 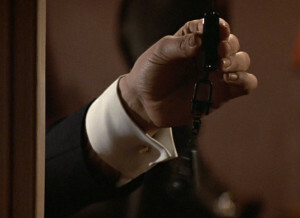 I think however it’s absolutely the proper thing for Bond to wear in this specific scene. Yes, Dan, it’s true and I know from previous postings that this conundrum interests you as it does me. To use an example, in the excellent 1970’s TV show, “The Streets of San Francisco” the premise was an older, traditional and conservative cop paired with a younger ex College cop. So, the older cop, played by Karl Malden wore conservative suits, knitted slipovers and American staple button down collar shirts, finished with a soft hat. Michael Douglas’ character on the other hand, in order to be youthful (for the mid 1970’s) wore sports coats and blazers. A number of his sports coats were in corduroy, tweed, plaid and some even had the half belt Norfolk style so despised on this blog. 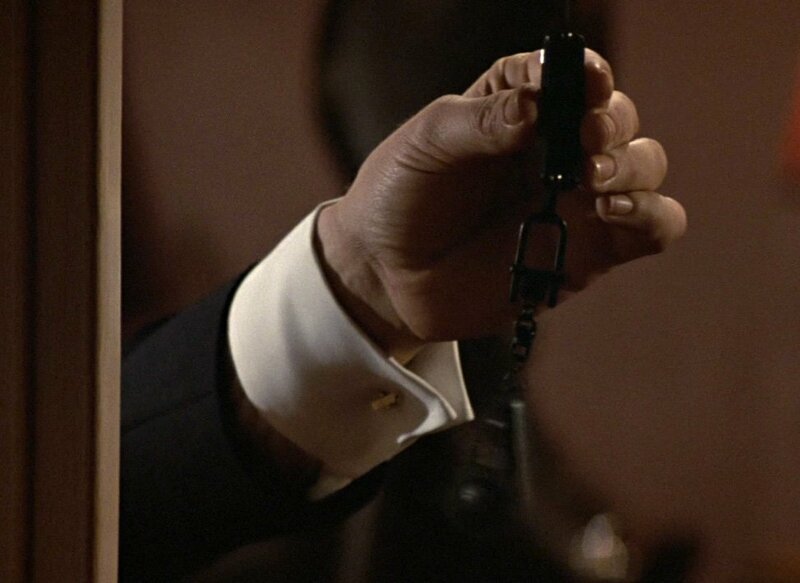 They had the full wide lapels of the time and were less restrained versions of Moore’s Bond versions. The popularity of sports coats continued in the 1980’s and on into the 1990’s but the age profile of the wearer advanced. So, it started to become the preserve of the older gent. Douglas, for example, is now in his mid 60’s and ironically if he were to play the older cop he’d probably wear sports coats and blazers and the younger cop would wear the shrunken suits popular right now. Something else happened which was the ultra casual trend (which had long been there) accelerated dramatically around the turn of the century. Many younger men came to view suits as something they were obliged to wear their workplace and outside of this context formal dressing was to be eschewed in favor of featureless, shapeless” leisure” wear. As well as sports coats the beige/tan or brown suit had always been viewed as a little too informal for the workplace (beige/tan) and more of a countrified look (brown) and these suits were generally worn for semi-formal but less professional occasions. Now, there is less half way house between suits and casual wear for younger generations so these suits are largely redundant. There is no imagination in any of this, of course, and some of us continue to plough our own sartorial furrow but sadly, that’s the way it is. Ironically, if Craig were to wear a blazer, sports coat or ivory dinner jacket for example, because he is viewed by so many as an example of a modern, well dressed man, we’d see the item in question gain currency. So, the decision is made at the level of the wardrobe personnel and these trend setters view these items as old hat and don’t have the imagination to expand their horizons. Finally, in a copy of this months GQ Magazine I saw Tom Ford pictured in a double breasted dinner suit, thereby neatly rounding off this little contribution! I am from Vienna and a little proud that TD weared the Suit. Great city! It was that movie that made me want to see it. And I love the fact that there are so many events around that are appropriate for me to bring formalwear. I went to a ball at the Rathaus, and it was amazing. Brosnan was briefly seen in another dinner suit at the end of TWINE, in Istanbul. I couldn’t tell if it was the same as the one in Baku. It’s a pity we don’t see much of the suit. I have a feeling it’s a well-tailored one, perhaps just because it’s Austrian. It’s not a Knize dinner suit alright, but I believe Austrian tailors have a reputation of cutting suits with clean and impeccable lines. Perhaps it’s not enough to declare there’s an Austrian style as well as a British or a Roman one, but that’s a good start. Matt, could the shirt be from T&A ? It would certainly be odd, but the cuff has the buttonholes placed very closed to the fold, a distinctive T&A feature if I remember well. The Living Daylights is without doubt my favourite Bond film. The actor, the locations and most importantly… the most believeable storyline to date! Some of the suits from the era comes in for a bit of stick… but I think they’re okay.